Chico, aka WTL Chico, is a handsome almost 3-year-old black male, born July 1, 2002. 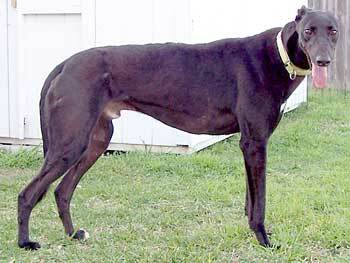 His sire is Aimin By Design, making his grand-sire Molotov, and his dam is Ima Fast Chick, an Irish-bred greyhound. Chico's racing career started March 24, 2004 and ended July 14, 2004, all races being at Corpus Christi. 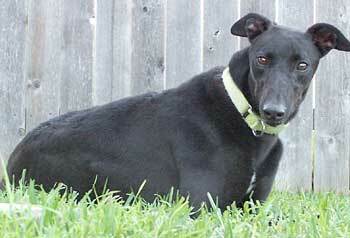 Chico is a sweet, very affectionate, playful greyhound. He is in a foster home with other dogs, cats and birds, and is adjusting very well. Chico is small animal and cat tolerant. It has been such a delight to watch Chico gradually gain confidence in his new surroundings. He's been a sweet, mellow fellow all along, but he's much less timid now. In fact, he loves nuzzling and will have plenty of kisses for his adoptive parent(s). Chico is still learning how to play, but enjoys chewing on knuckle bones and rawhide bones. He mostly wants to be in the same room as his human. He enjoys the company of other dogs and is very respectful of the cats. He doesn't like the sound of a growling African Grey, so he stays away from the birds, too. Chico is house-trained and trustworthy enough that I don't crate him when I leave the house. He also sleeps on a dog bed at the foot of my bed at night. He has adapted to his foster home very nicely and I know he'll be a welcome addition to his forever home, too.